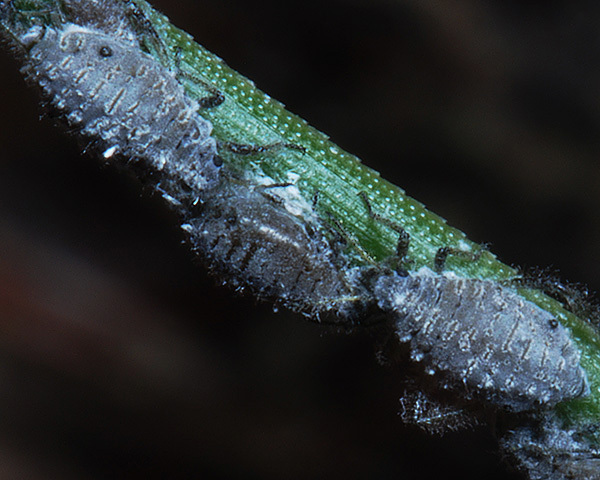 Schizolachnus are small oval-bodied, hairy aphids. The body is usually covered with a dense coat of flocculent wax. The siphuncular cones are small and pale. The Schizolachnus genus includes seven species (four nearctic and three palaearctic) all of which feed on pine (Pinus species) needles. They are found as small densely packed colonies along a needle. 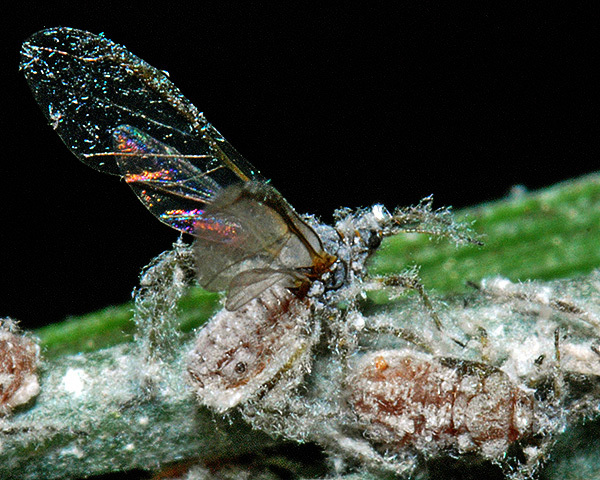 Despite the rather different appearance of the aphids, Schizolachnus is closely related to Eulachnus. Schizolachnus pineti apterae (see first picture below) are dark greyish-green or occasionally brownish, and are covered in wax meal giving a light bluish-grey appearance (cf. Schizolachnus obscurus which is usually brown and wax-covered). The fourth rostral segment (RIV) is 2.3-3.7 times the length of the fifth rostral segment (RV) (cf. Schizolachnus obscurus in which RIV is 1.6-2.1 times the length of RV). RV is short and stumpy and is 33-43 μm long (cf . Schizolachnus obscurus in which RV has an extended tip and is 43-60 μm long). The hind tibiae are pale or dark and very densely hairy. 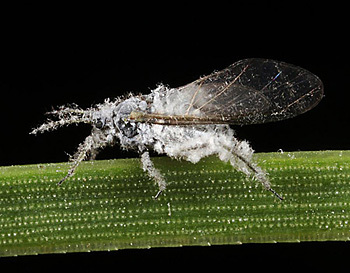 The body length is 1.2-2.5 mm. Schizolachnus pineti alate (see second picture above) is similarly covered in dense grey wax meal. Schizolachnus pineti can be found on numerous species of Pines (Pinus species), but especially on young Scots pine (Pinus sylvestris) where it forms dense colonies in rows along the previous year's needles. 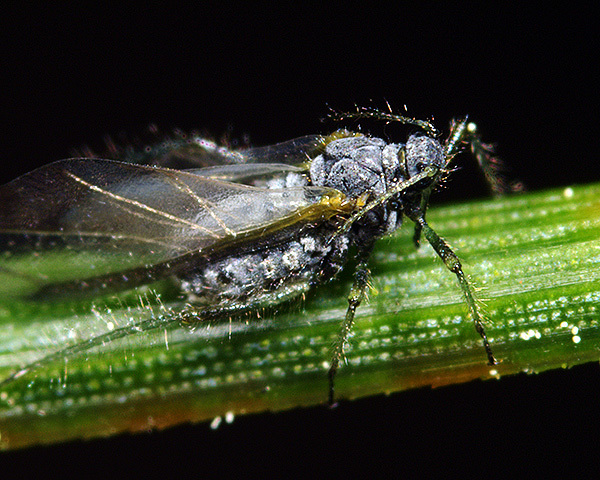 Oviparae and alate males occur in October-December, but in years with mild winters colonies may persist through to the next year. Schizolachnus pineti is common and widespread in Europe and parts of Asia and introduced to North America. David Fenwick, 11 July 2013, Schizolachnus obscurus? Have been looking on the pines in a local cemetery, and at various times over the past month or two. They seem clean but yesterday I had my first pine aphid from them. Was hard work and it seemed to be the only one, I think possibly Schizolachnus obscurus. Was on a two-needled pine, needles appeared a bit stiff for P. sylvestris so might have been another species. Tree too small to tell from [growth] habit. Would be pleased if Schizolachnus obscurus could be confirmed as there are no Schizolachnus on the Cornish database. It would be good if you could confirm the pine species. 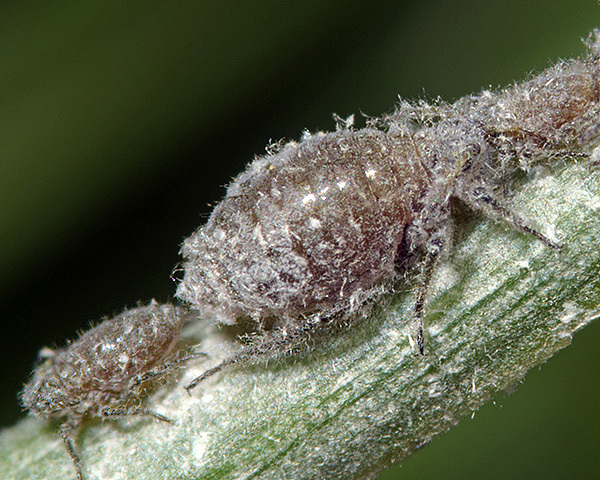 Having said that, both aphid species occur on both Scots and Corsican Pine, although with different relative abundance. Probably the best way to distinguish for certain is to drop aphid specimen in alcohol, which partially removes the wax and makes it easier to see the underlying colour. I should have done that on site, I carry absolute [ethanol] with me wherever I go; my only problem is that I have to get the idea well in my head first else I forget. Will certainly get round to this soon. BTW Gutted about not identifying that pine, we had to do a lot of work on pines when I was at college. Mind you, some time ago now. Will see what I can do to ID it.